Late in 2016 Aer Lingus the national airline of Ireland replaced their Gold Circle program with AerClub and it became part of the Avios family. Avios is the main currency of the British airways Executive Club program and other programs that all fall under BAs parent company IAG like the UK's Avios coalition program (formerly Air Miles) Iberia Plus and Meridiana Club. With this change also came some changes to British Airways award chart that enraged some U.S. Executive Club members as previously you could redeem Avios for travel on Aer Lingus between Boston and Dublin at a very low rate (Zone 4) but BA decided to move Boston a few miles further to move it into a higher redemption category. This didn't really affect us Canucks very much unless you redeemed for that route but the next change in the program does affect us and does so in a really good way! How do you get this flight for free other than your typically taxes and fees? You get yourself Canada's Top Overall Travel Rewards card, the American Express Gold Rewards Card and this new redemption possibility makes the card even better! The card comes with a 25,000 Membership Rewards Points sign up bonus when you spend $1,500 on the card in the first three months and it has no annual fee in the first year. At a minimum that gives you 26,500 Membership Rewards points for nothing other than your every day spend. Those points can then be transferred to British Airways Executive Club at a 1:1 rate easily getting you the 26,000 Avios required for the round trip. Of course you have to pay the taxes and fees but you can also use your Gold Rewards Card to pay for those and then redeem the points against the charge once it posts to your account. 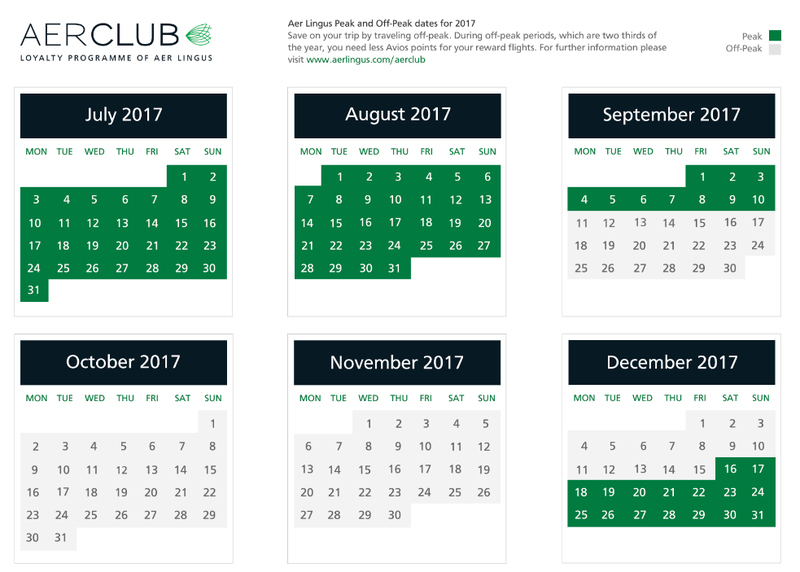 Aer Lingus award flights cannot be booked online via BA Executive Club but you can check availability on the Avios website or via United MileagePlus then call up British Airways to book. 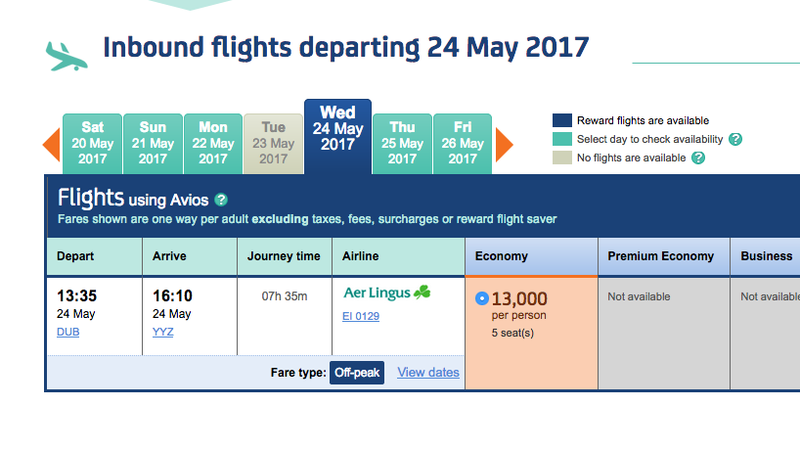 Do not book via the Avios.com website as the taxes/fees are higher then booking via British Airway call center. You can get this redemption for even less as during certain times of the year American Express offers a bonus for converting MR points to BAEC. 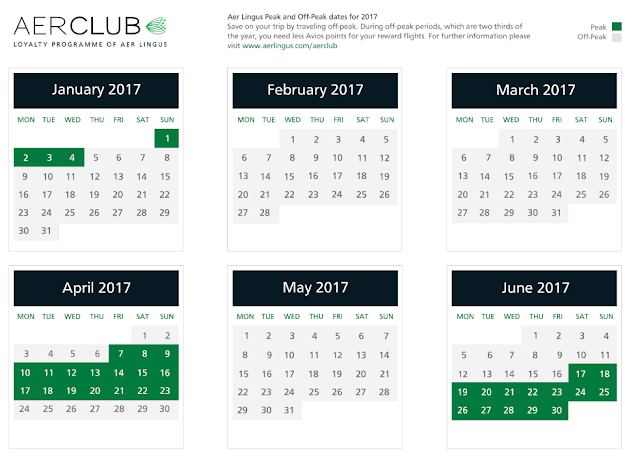 That bonus is typically 25% so you could redeem 21,000 Membership Rewards points to get enough Avios for the round trip. We don't take that into account in our look at this option right now but just know it can be there to make these flights even cheaper. As you can see most of the year can be had at the lower redemption rate! If you want to get even more tickets to get your family of four to Ireland you can jump on more credit cards. Have your significant other or spouse also sign up for the Gold Rewards Card. Just like above, spend the $1,500 and your spouse now has enough for one round trip flight. Then have one of you grab the Starwood Preferred Guest Credit Card from American Express. The card will net 20,000 Starpoints when you spend $1,500 on the card in three months. Then refer your significant other/spouse to the card as well. You'll get 10,000 Starpoints for referring and then your spouse should get to 21,500 Starpoints as well after hitting the spend requirement. Each of you converts 21,000 Starpoints to British Airways and Starwood will kick in an additional 5,000 Avios. There you have it, 2 more sets of 26,000 Avios tickets at your disposal. 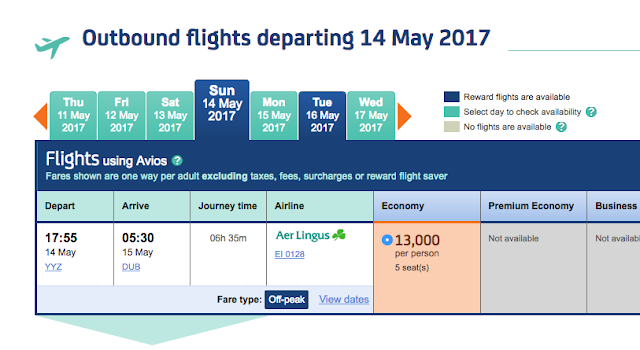 Four in total and your whole family flies to Ireland. The SPG cards do not have a first year free offer so the cards will cost you $240 ($120 per person) but that is still a really good deal to essentially get each ticket for $120. 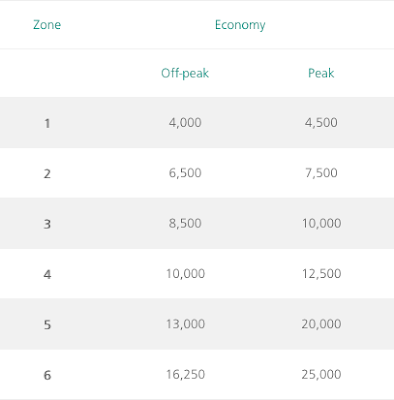 Plus the SPG referrer will have 10,000 Starpoints to use on hotel stays as well. The Sheraton Athlone in Ireland is only 3,000 to 4,000 points per night! We have to tip our hat to The Points Guy who brought this new option to our attention. • New American Express® Gold Rewards* Cardmembers can earn a Welcome Bonus of 25,000 Membership Rewards® points just by making $1,500 in purchases in the first three months of Cardmembership. • No Annual Fee for the first year; $150 Annual Fee thereafter* • That’s enough to redeem for a round-trip Fixed Mileage Flight Reward TM* to almost anywhere in North America.